This week I read the first book in the Jagged Ivory -series (well, to be honest, I read the second one too and I’m just about to start the third one…); Jagged Hearts. And I loved it. A bad boy rockstar, loud guitars, screaming fans… this book has them all and little bit more. It’s a HEA story of Noah and Mercy, but it’s also a story of a band Jagged Ivory on the verge of their international breakthrough. It’s about the brotherhood of the band members, more or less functional families and struggle behind stardom and fame. Lashell Collins is writing it like she’d lived it (and I don’t know, maybe she has). But nothing of the story feels fake. And above everything, it is just fun to read. Grilled salmon is served on the early pages, when Mercy has her weekly date with her father, Mike Holland. Mike owns a management company and they just happen to represent Jagged Ivory. And that’s how Mercy and Noah get their second chance. But as in real life, it isn’t that easy in the book either. But back to the salmon, in this scene Mercy’s graduation day is near and her father wants to talk about her future over the dinner. “And have you given any more thought to Harvard?” he asked gently, knowing that this was a delicate subject. 1. Start the grill about half an hour before you are going to grill the salmon. 2. Wash the potatoes, no need the to peal the new season potatoes as their skin is thin. The best way to cook them is in a steam boiler. That way most of the nutrients are preserved. 3. When the grill is ready, set the salmon medaillons on a piece of tin foil (fold the edges a bit). 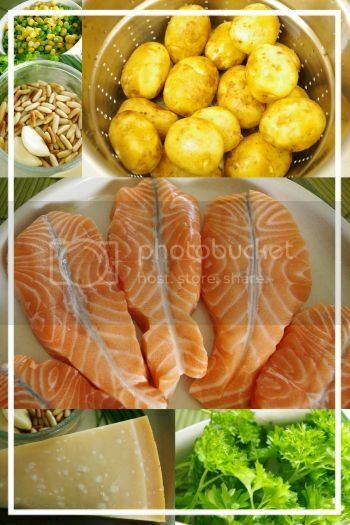 This will help the cooking as salmon tends to be quite tender when cooked. Grill the salmon for about 15 minutes. 4. Chop the parsley and chives and the garlic clove. Put them in a food processor and blend them. Add the dry roasted pine nuts and grated parmesan cheese. Add olive oil in small quantities until you reach smooth consistency. 5. 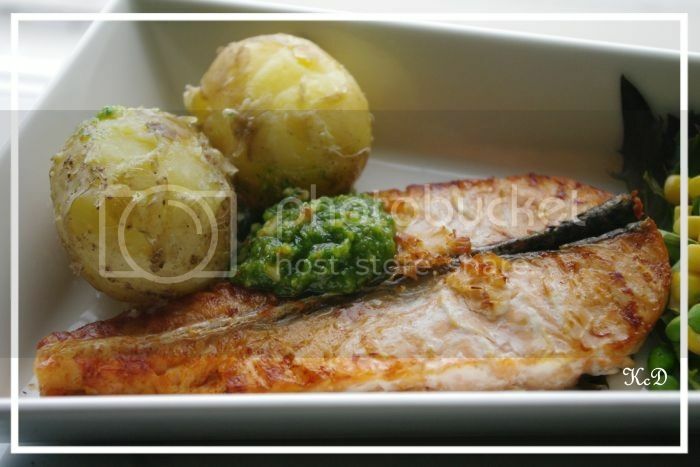 Season the salmon with seasalt and serve with potatoes, parsley pesto and tossed salad. Gotta love a good rock star romance! Jagged Hearts was fun to read, the story flow was seamless and the characters were interesting. This book was definitely HEA-romance, with a rock star twist. Four years later their paths cross again and this time, neither of them know what they want. And that’s about everything I can say without spoiling the story. I will recommend the book, simply because it was a good one. Besides being about a romance, this book is about families, brotherhood and frienship. It is well written with good characters and a story, that you have to finish.